The Boulder City Police Department has created a new position to provide extra security and save money. 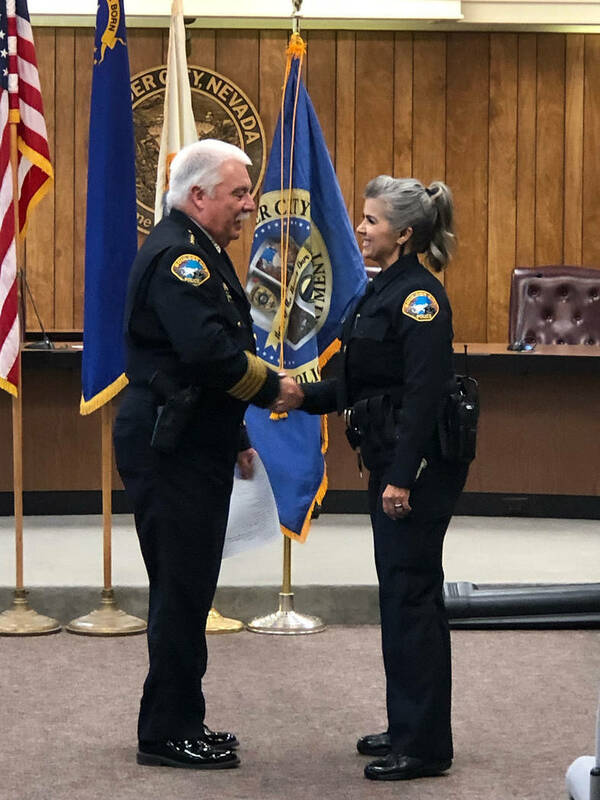 Boulder City Pamela Purkey is sworn in on Nov. 20, 2018, as the first Boulder City Police Department Marshal. Her husband, Jeremy Leinan, pinned her badge on her during the ceremony. He is a police officer with the Henderson Police Department. Boulder City Boulder City Police Chief Tim Shea swears in Pamela Purkey as the first Boulder City Police Department Marshal on Nov. 20. Pamela Purkey was recently sworn in as the Boulder City Police Department Marshal by Chief Tim Shea. Shea said he plans to have one officer and one marshal at each City Council meeting. Currently, two police officers work overtime to staff the meetings, which costs approximately $100 an hour in pay and benefits. Having a marshal cover the meeting will cost about one-fourth of that amount. Purkey is no stranger to Boulder City or law enforcement. Before being sworn in as a marshal, she volunteered at the police department for four years and then put herself through the academy. She was also an adviser the Boulder City Explorers. She said she started the process later in life because she was a single parent at the time and had to wait for her daughter to get older. “It’s been something I’ve been wanting to do for a long time,” she said. 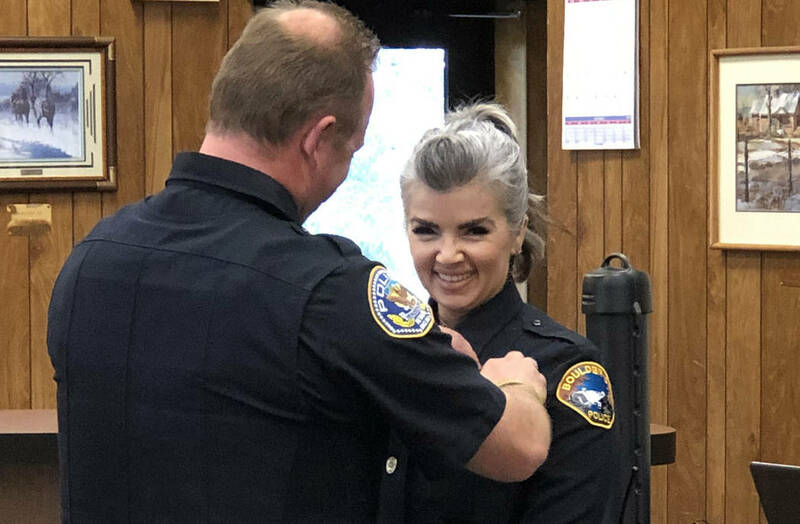 After completing the academy, Purkey said, she worked as a Boulder City Municipal Court marshal before taking some time off and then starting her new position. Purkey said she went into law enforcement to make a difference and is looking forward to being a new face for the community. “The best part of it is being able to bridge that gap for the citizens and being that friendly face,” she said. She said she also wants to help Shea expand the marshal position by “duties and bodies” and become of more assistance to the police department. Shea said he wants the marshals to help provide a safe environment at council meetings for citizens and employees. Shea and Purkey are looking at the best way the marshals can augment the police department. One idea is to have them transport prisoners to jail rather than having officers do it, he said. Additionally, Shea said he wants to work with City Manager Al Noyola to make sure the program meets his expectations. The marshal position is part time and limited to no more than 40 hours in a two-week pay period. Shea is in the process of hiring an additional marshal. Purkey is a Category I officer through the Nevada’s Peace Officers’ Standards and Training Commission, which means that she can enforce local and state laws as well as making arrests. All the Boulder City Police Department marshals are required to be a Category I or II officer.